Debuting as it’s ‘own brand’ in the 2017 model year, Genesis was previously part of the Hyundai stable. 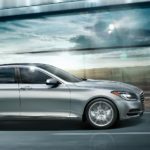 Introduced in March 2007 as the “Concept Genesis,” the sedan was designed by Hyundai as a “progressive interpretation of the modern rear-wheel drive sports sedan.” Then in 2003, Hyundai conceived the idea for the “Genesis,” part of the Hyundai lineup. A favorite of this writer, the Genesis epitomizes luxury and comfort, and in 2016 when looking to replace my beloved 2003 Infiniti G35 (and couldn’t swing the replacement Q’s pricing), I tried to negotiate a deal on a 2016 Genesis. No luck. 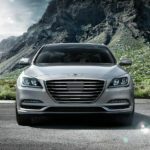 Dealers didn’t seem to be willing to move the pre-driven Genesis,’ even though a new brand and dealerships were coming. Enter 2017, and the debut of the ‘new’ Genesis G80, and its stablemate, the G90. Features that had been optional became standard in this new rendition, which didn’t make it any more affordable for the masses, but more desirable for those driving higher-end sedans. In 2018, Hyundai introduced a new trim level: the 3.3T sport, with a new twin-turbo V6 engine, and top-of-the-line G80 features. The powerplant in the new Genesis G80 is Hyundai’s V6 engine, with 311 horsepower, mated to an eight-speed automatic transmission. One can also opt for the optional twin-turbo V6 (365 horse), or the V8 (420 horse). All are enough power for the average driver, providing a smooth, capable ride. As expected, the G80 comes equipped with a long list of features, however, we found it odd that our 2018 G80 test vehicle was without a standard sunroof. Climbing into the cabin of the new G80, you’ll feel the difference in trim materials: high quality. Hyundai’s 3.8-liter, V6 engine is plenty powerful, smooth and agile. Horsepower at 311, mated to the eight-speed automatic transmission makes for ease in driving, and plenty get-up-and-go when you need it. Buyers can opt for three trim levels, starting at a $41,750 price point. Still less than the average luxury midsize car price, the G80 offers most of what these drivers want. The Sport trim level ($55,250), is new and one can add all-wheel-drive for $2,500, with two packages available. If you spend another $5,000, you’ll move into the Premium trim level, adding such features as wireless charging, and that panoramic sunroof. The Ultimate package ($5,100) adds such amenities as a larger touch screen, multi-angle camera and heads-up display. Expect to be up against the big players such as the Mercedes-Benz E-Class ($52,150), and the ever-popular Lexus GS ($46,310). It’s hard to beat the Lexus brand, but Hyundai is gaining on them. The most progressive in technology such as smartphone integration can be had by both Lexus and Hyundai, and one can get it for a little less with the G80. In terms of power, the Lexus GS offers a 4-cylinder as base engine, while the G80, of course, the V6. We preferred the G80s large touch screen, in comparison to the GS’ infotainment center. However, if you’re counting MPG, you’ll opt for the Lexus GS; the base gets 22/32 mpg, the G80: 19/27 mpg. But then, we highly doubt these buyers are counting pennies. Of course, one can opt for the larger V6 engine in the Lexus GS (compromising fuel economy, 20/28 mpg). As expected, the Genesis G80 has many standard safety features, including standard rearview camera. In addition, it is equipped with lane departure warning, lane keep assist, blind spot monitoring, rear cross traffic alert, adaptive cruise control, lane change assist, and automatic emergency braking with pedestrian detection. Also available are safety features such as a multi-angle camera, front and rear park assist, and adaptive LED headlights. The G80 is a midsize sedan with a large interior and seating for at least five. Heated front seats, leather, 16-way adjustable driver’s sport front seat and sport steering wheel-heated-is standard, as well as ventilated front seats. The ample seats are comfortable, and legroom abounds in the rear seating area. Head room could be a little more plentiful in the rear, but the G80 feels like a big car. Interior quality feels luxurious and high-end. We liked the wood trim, and if were purchasing this vehicle, would probably opt for the new Sport model with its classy carbon-fiber trim. The contrast stiching is a new look we think ads sportiness and class. Above average in cargo space, the G80’s trunk measures 15.3 cubic feet, but the rear seats aren’t the fold-down kind, so that’s limiting. A power trunk lid is optional, as the G80’s trunk is hands-free, opened by standing behind it (with the keys on you). As far as technology for those who must have it, the G80 is equipped with two USB ports, Android Auto, Apple CarPlay, 8-inch touch screen, 4.3-inch driver indo display and push-button start. For those who want to move up, you can add the panoramic sunroof, multi-angle camera, heads-up display and 7-inch driver-information display. Warranty: five-year/60,000-mile basic warranty and a 10-year/100,000-mile powertrain warranty. This is better than Mercedes-Benz’s warranty of four years or 50,000 miles for the E-Class. Crash test results: perfect five-star overall rating. The top-of-the-line 5.0 model starts at $57,000 and comes with a 5.0-liter V8 engine and lower trim features. It adds 19-inch alloy wheels, front LED fog lights, and wood and suede trim.